Encrusts rocks with a thick mat. Polyps are fine and hair-like. The mat is tan or pinkish and the area around the polyp openings are usually white, the openings are very small and flat to the surface. The mat edges are often red. 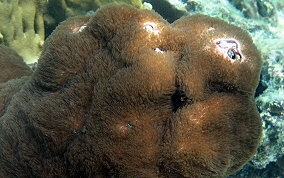 Polyp color light brown to dark cinnamon color. Colonies grow in shallow areas of rocky shoreline where there is some wave action.